Save Mart C.A.R.E.S. has donated $25,000 to help homeless women in Sacramento find homes and jobs to support their families through Women’s Empowerment’s comprehensive job readiness program. 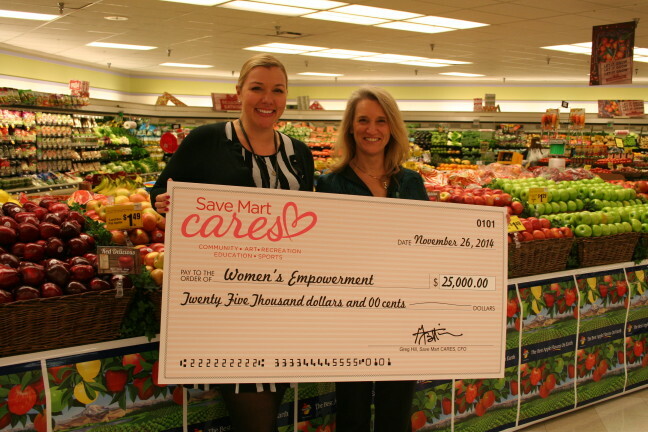 The mission of Women’s Empowerment aligns closely with the mission of Save Mart C.A.R.E.S., which supports programs that have a record of results and contribute to the advancement of community, arts, recreation, education and/or sports. Women’s Empowerment offers the most comprehensive job-readiness program in the Sacramento area designed specifically for women who are homeless and their children. The 2014 Organization of the Year has graduated 1,177 homeless women and their 2,552 children. Last year, 81 percent of graduates found homes and 90 percent found jobs or enrolled in school or training. The program combines self-esteem courses, job training, health classes and support services to help homeless women across diverse ages, races and cultures. Women’s Empowerment is funded solely through private donations from the community. To donate online: www.womens-empowerment.org.